Geelong Mayor Bruce Harwood, genU support worker Connor Thompson, genU participant Ryan Schmidtke, Westfield Geelong Centre Manager Daniel Annetta, City of Greater Geelong Cr Anthony Aitken - Disability Access, Inclusion and Volunteering portfolio (Chair), Cr Sarah Mansfield. Making life easier for people with mobility issues or disabilities is the aim of a project intended to make Geelong city centre and waterfront easier to access. 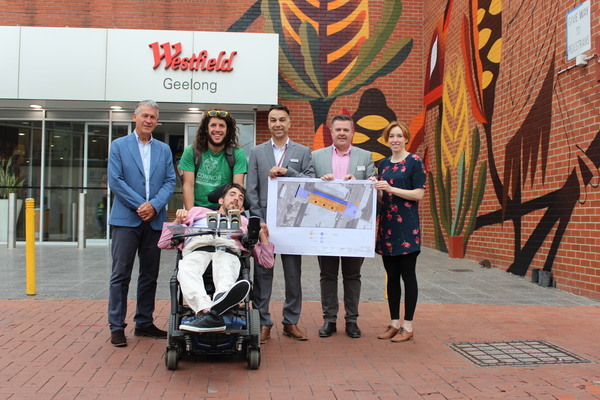 The project has state and council funding to improve pedestrian access at Westfield Geelong’s Moorabool St entrance and at Eastern Beach, with completion scheduled for the start of winter. The works would address barriers identified in an accessibility audit of central Geelong on behalf of people with limited mobility, particularly wheelchair users, City Hall. Planning Minister Richard Wynne said Geelong had to become “more accessible for people of all ages and abilities”, particularly since it had become home to social insurance agencies WorkSafe, TAC and NDIA. The improvements were part of a Revitalising Central Geelong Action Plan turning the city into “a magnet for new jobs and growth,” he said. Mayor Bruce Harwood said the shopping centre improvement and a further eight footpath improvement projects in the Eastern Beach area would help the city “continue to be a leader in accessibility and social inclusion”. “This project builds on two floating beach wheelchairs and rubber beach matting pathway at Eastern Beach,” he said. Last year the Indy reported concerns that inadequate access to even basics like toilets could be costing Geelong a fifth of its potential tourism trade. Member of Geelong Christine Couzens convened a forum in May to discuss the city’s shortcomings for people with disability or mobility issues, including the elderly and young children. “There are some great opportunities for Geelong to take the lead to become an amazing accessible city and to the lead the way, not just for residents for tourists as well,” she said.